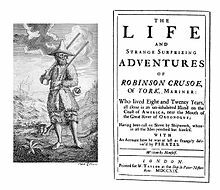 ↑ "The Primitive Crusoe, 1719–1780.". Picturing the First Castaway: the Illustrations of Robinson Crusoe - Paul Wilson and Michael Eck. Retrieved 25 June 2012. ↑ "Defoe", The Oxford Companion to English Literature, ed. Margaret Drabble. (Oxford: Oxforsd University Press,1996), p. 265.